Home / Entertainment News / Here’s the drug ladies are spiking in men’s drinks and forcing them to reveal their Mpesa PINs, kuweni makini wanaume. Here’s the drug ladies are spiking in men’s drinks and forcing them to reveal their Mpesa PINs, kuweni makini wanaume. 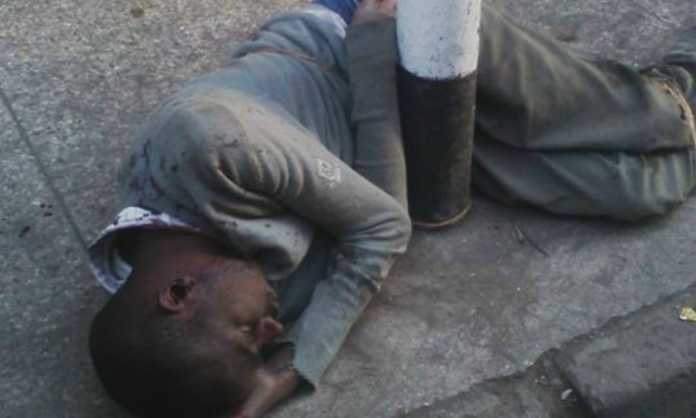 Thursday, February 7, 2019 - A man has narrated how he was drugged by a lady called Doreen Gakii after he invited her to his house for some nice time. Doreen spiked his drink with a drug called scopolamine, popularly known as the Devils’s breath, a lethal drug that causes confusion and makes someone lose his mind. This is the drug ladies are using to spike in men’s drink and forcing them to reveal their Mpesa pins once the drug gets into the body. This man lost Ksh 4,500 to the lady. Read this expose on the popular Dark Tera telegram channel and be careful with ladies. This man was drugged and the lady transferred Ksh 4500 from his mpesa. Expose this one. Anakuwekea mchele alafu anakupora. 4,500 gone. “If i tell u how she did it hautaamini. She drugged me..this morning as i was to pay for my zuku, i received a failed mpesa message indicating insufficient funds..on confirming my transactions i noticed there was a missing transaction. Requested a statement an infact they were not one but 2 transactions going by florindah mwende. Unfortunately reversal was unsuccessful as she had already withdrawn. It was only me and that chick in the house. Its the second time it has happened. First time i was lucky enough i only had 1k so i lengad.There is something they use to spike ur drink and u reveal your pin. Believe it or not. 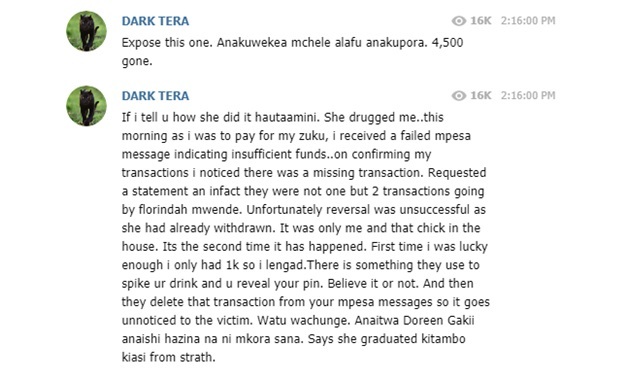 And then they delete that transaction from your mpesa messages so it goes unnoticed to the victim. Watu wachunge. Anaitwa Doreen Gakii anaishi hazina na ni mkora sana. Says she graduated kitambo kiasi from strath.